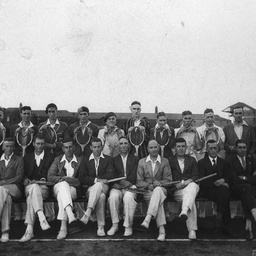 The 1922 Adelaide University tennis team.GENERAL: The 1922 Adelaide University tennis team. Back row: A.E. Leidig; F. Leditschke; F.W. Hoopman and A.W. Welch. Front row: G.M. Hone and D.J.R. Sumner. 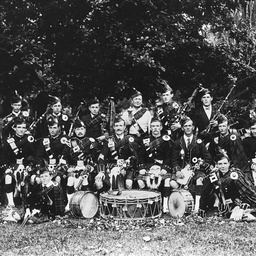 Adelaide Highland Pipe Band, 1911.GENERAL: Members of the Adelaide Highland Band. Back row, left to right: ? Reichbeth; ? ; Dave Thomson; ? ; Drum Major Jack Bruce; Norm McKinnon; Ashley ? ; Dave Young. Second row: Joe Thompson; Allan Lett; ? ; Pipe Major Bill McLennan; Drum Sergeant ? McKenzie; Bill Niven; ? Murray; ? Thompson. Sitting: Jack McLennan; Bill Young. 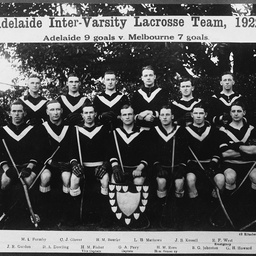 Adelaide Inter-Varsity lacrosse team.GENERAL: Adelaide Inter-Varsity lacrosse team, 1922. Adelaide Rowing ClubPhotograph of the Adelaide Rowing Club on opening day (19 November 1927), taken on the grass in front of the club rooms on the bank of the Torrens River. A number of the people in the photograph have been identified using a grid system, with the front row being 1 and the back row being 8. The men are then numbered from left of each row eg 1.1 is the man first left in the front row. Using this system, the identified members of the group are: 1.1 Perc Haddy; 1.5 ?J.H.Gosse; 1.6 Governor of SA, Sir Alexander Hore-Ruthven; 1.7 J.M.Jay (treasurer); 1.8 A.J.Grayson, 1.9 K.B.Forwood; 2.7 R.H.Wallman; 2.9 J.T.Sheppard; 3.8 J.Vardon; 4.2 L.T.Grummet; 5.4 W.O.Menz; 5.5 H.V.Menz (captain); 6.1 R.D.Clark; 6.7 I.Golovsky; 6.8 C.A.M.West; 7.2 D.N.Linnett; 7.6 S.T.Facy, 7.7 J.P.Marcus; 7.9 R.J.Gillingham; 8.7 B.F.Hopkins. 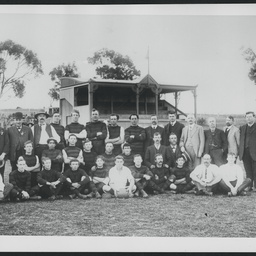 Australian soccer teamPlayers and officials of the Australia soccer team that played the fifth and final test match against Canada in Adelaide on Saturday 12 July 1924. 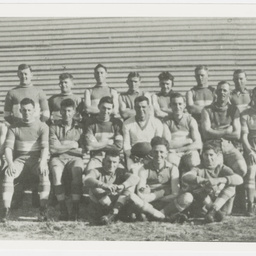 Back row L-R: H. Spurway (NSW), Fred. Gallen (NSW), T. Bristoe (Vic), G. Cartwright (NSW), G. Storey (NSW), G. Raitt (Vic). Front row L-R: C. Williams (NSW), William (Bill) Maunders (NSW), E. Lukeman (Commonwealth Secretary), James (Judy) Masters (NSW) captain, W. Bellis (South Australian Secretary), Jim Orr (Vic), Fred. Ramsay (NSW). The Australian winning team of the Empire shooting match.GENERAL: The Australian winning team of the Empire shooting match at Melbourne, Nov. 15-16 1920. Front left sitting on the ground is W. Green of S.A. Scores: Australia 2094; Great Britain 2071; New Zealand 2046. 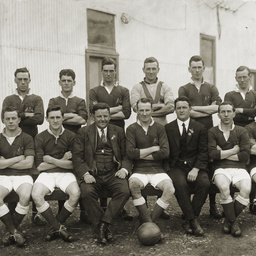 BALGOWNIE RANGERS SOCCER FOOTBALL CLUBTitle on photograph: Balgownie Rangers Soccer Club Undefeated; Undefeated Premiers 1921; Top row from left: W. Dixon (Manager), H. Masters, T. Batey, P. Hunter, Wadie (Trainer). 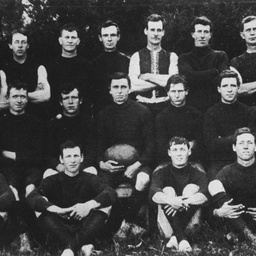 Centre row from left: S. Learmonth, W. Johnston, R. Johnston, H. Johnston (Captain). Front row: G. Guest, D. Ward, J. Masters, T. Thompson, A. Mc Mahon. 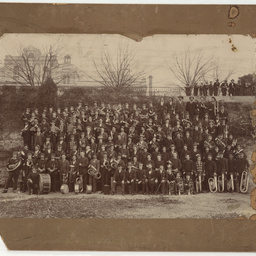 BandsmenGENERAL: A large group of bandsmen from various bands; they stand together, in no particular order, holding musical instruments. BELLAMBI FOOTBALL CLUBFirst grade team. Back row from left: T. Spinks, B. Lear, W. Schadel, L. York (President), A. "Dooley" Lear, F. Treaven, W. Birch. Middle row: F. Manski, J. Riordan, D. Gray, G. Schadel. Front row: F. Crago, T. Marshall, P. Ross (Captain), T. Saunders and C. White. 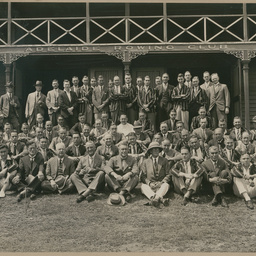 The Benalla Band with their instruments.The Benalla Band in 1929 with their instruments. Taken in a studio or on a stage. Standing left to right: G. Ayre, G. Briggs, F. Truemin, L. Jenkins (Bandmaster), J. Burns, K. Simon, L. Turner. Middle row: F. Glazebrook, R. Barnfield, J. Smith, G. Oliver, F. Standish, B. Hutchins, P. Richardson. Sitting: R. Jenkins and H. Chittock. William John Howship (1874-1932) opened a photography studio business in Nunn Street Benalla in April 1904. He expanded the business by selling small format Kodak cameras and providing a 24 hour film processing service as well as the actual photography work, both studio and outdoor. The collection consists of 1250 dry plate glass negative images created by Howship between 1904 and 1931. Images include views of Benalla and surrounding districts, local events such as floods, concerts and military ceremonies and a large body of portrait work. Item held by the University of Melbourne Archives. Brass Band, KadinaKADINA: The A.W.U. 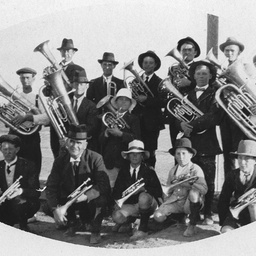 Brass Band, winners of the Yorke Peninsula contest, 27 December 1913. 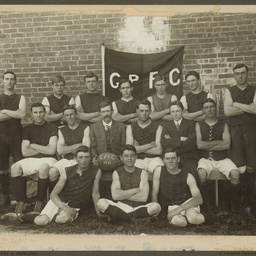 Back row: T. Betts; J. Ruby (Committee); G. Trenwith; W.J. Harwood; A.H. Head (Drum Major); A. Ramsey; S. Maroney; H. Lloyd (Hon. Secretary); J.R. Richards (Committee). Second row: J. Brown; C.W. Jerdan; J. Mutton; B. Clark; A. Hine; G.Johns; M. Martin. Third row: S. Skews; S. Phillips; C.E. Ramsey; R. Tonkin; W. Champion (Conductor); W.E. Roberts; A.B. Hancock; S. Varcoe; A. Craddock. Front row: C. Penhall; H. Trenwith; A. Trenwith; W. Cadd. 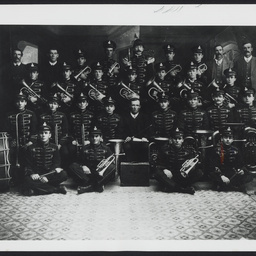 A brass band possibly from Quorn.GENERAL: A brass band possibly from Quorn. BULLI SECOND GRADE CRICKET CLUBOriginal held. Title on photograph: Bulli 2nd Grade C.C., Winners Illawarra District Competition 1914-1915. 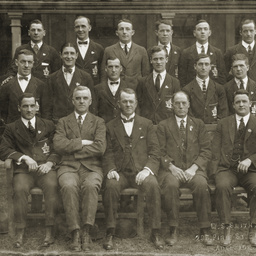 Back row: A. Davidson (Vice-President), G.W. Clark (Manager), J. Barnes (Patron). Middle row: Jack Hasson, A. Hill, Jas Hasson, H. Green, J. Fleming, G. Player. Front row: D. Oldroyd, J.H. Shipp, B.J. Troman, G. Moore(Captain), E.E. Clarke. Canadian soccer teamPlayers and officials of the Canadian soccer team. The team played South Australia on 9 July 1924 winning 2-0 and Australia on 12 July 1924 winning 4-1. Back row L-R: R. (Dickie) Stobbart (Nanaimo), William (Bill) Linning (Lethbridge Veterans United), Leslie Ford (Regina Thistles), William Sanford (Montreal Blue Bonnets), George Forrest (Toronto Ulster United), Jack Armstrong (Vancouver St. Andrews). Middle row L-R: M. McLean (Calgary), H. Noseworthy (Montreal), Fred Dierden (Toronto Willys-Overland), Jim Wilson (Edmonton Royals), J. Hood (Brandon), Fred Bowman (Saskatoon Radials). 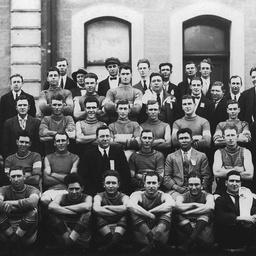 Front row L-R: Robert (Bob) Harley, captain, (Winnipeg United Weston), James Adam manager (Victoria B.C.) Lord Mayor of Adelaide C.R.J. Glover, T. Thompson, president South Australian B.F. Association, W. Bellis (Adelaide South Australia). 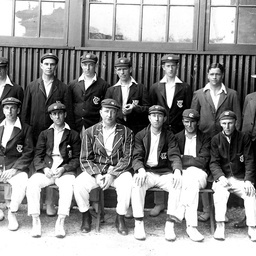 Cricket players for Australia including Warwick ArmstrongA group of six cricketers in Australia; Warwick Armstrong, captain, sits centre of the front row. 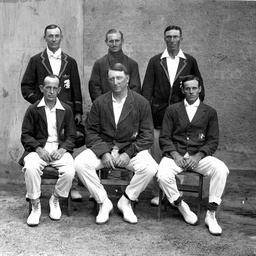 The players are (back row) JB Hobbs (England), CE Pellew (South Australia and Australia), an England player (possibly FE Woolley): front row HL Collins (NSW and Australia), WW Armstrong (Vic and Aust), CE Kelleway (NSW and Australia). 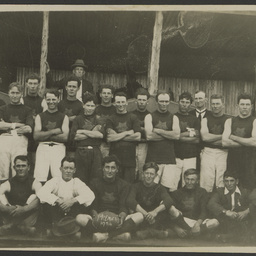 The photo was taken during the 1920-21 Australian cricket season. 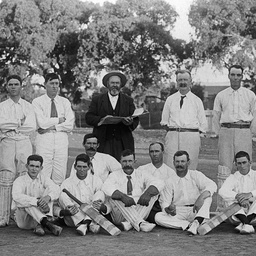 Cricket team from Victoria.Members of a cricket team representing Victoria visiting Adelaide; Warwick Armstrong, captain, sits front row, third from the left. A cricket team in front of the rotunda in the Benalla Botanical Gardens.An unidentified cricket team posed in front of the rotunda in the Benalla Botanical Gardens. William John Howship (1874-1932) opened a photography studio business in Nunn Street Benalla in April 1904. He expanded the business by selling small format Kodak cameras and providing a 24 hour film processing service as well as the actual photography work, both studio and outdoor. The collection consists of 1250 dry plate glass negative images created by Howship between 1904 and 1931. Images include views of Benalla and surrounding districts, local events such as floods, concerts and military ceremonies and a large body of portrait work. Cricket team possibly from Quorn.GENERAL: A cricket team possibly from Quorn. Cricket team representing Victoria with captain Warwick Armstrong.Members of the cricket team representing Victoria sitting with their captain Warwick Armstrong, centre front row, photographed whilst they were visiting South Australia. Elder Smith inter-departmental tennis competition.GENERAL: Players in an Elder Smith inter-departmental tennis competition on Memorial Drive Courts. Eyre Peninsula Football Club.GENERAL: Members of an Eyre Peninsula Football Club. 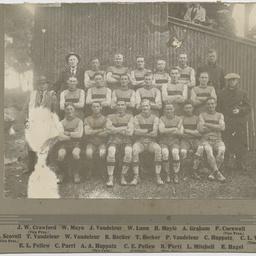 FLINDERS SOCCER FOOTBALL CLUBTitle on photograph: Flinders Soccer Football Club (Premiers 1915); First row: C. Booth, B. Gittins, P. Musgrave, R. Learmonth, S. Davies. Second row: F.A. Parsons, (Treasurer), A. Learmonth (Manager), T.J. Woods (Patron), E. Puckeridge (Vice-President), Driver G. Graham (Life Member). Third row: W. Woods (Trainer), W. Wales, L. Oswald, F. Parsons (Linesman), J. Wales, A. Simpson, W. Learmonth (Trainer). 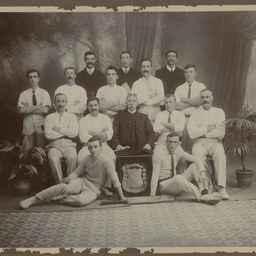 Fourth row: F. Puckeridge (Captain), J. Puckeridge (Secretary), J. Wrightson (Vice-Captain). 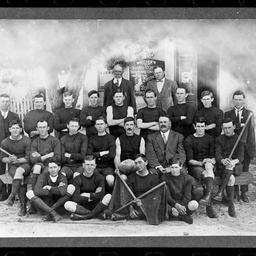 Football Club, GawlerMembers of Gawler Central Football Club. Back row (left to right): ? Nelson, C.Williams, Alan Grace, F.Wilson, Alan Haydock. Third row: E.Stewart, W.Thompson, M.May, C.Withers, F.George, C.Footer (trainer). Second row: Reg Beadnall, Les Thomas, Nick Broderick, Charles Winkel, T.Hancock, Frank Green, George Dawe. 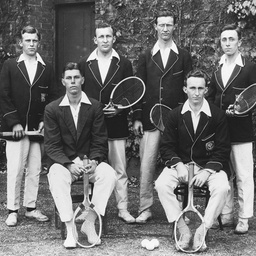 Front row: D.Thomas, H.Olafsen (boy), E.Goodger, George French (vice-captain), Tod Solamon (captain), C.Gwynne, F.Barkla, F.Thomas. Football Club, GeorgetownMembers of Georgetown football club. Back row (left to right): P.Brogan (delegate), E.Speck (delegate). Third row: G.Smallacombe, F. Brogan, R.King, D.Clancy, W.Phillis, J.Cox, F.Buckenara, J.Hill, L.Brogan. Second row: P.Fogarty, A.Brogan, F.Page, L.Buckenara (Hon. Sec. ), J.Buchan (captain), W.Hill (president), T.Phillis (vice-captain), W.Brogan. Front row: M.Fogarty, M.King, E.Speckman, G.Hill. 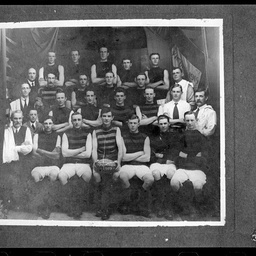 Football Team, AuburnPremiers Mid-North Association football team. Back row: C. Wills; G. Kirk; B. Meller; W. Whitehead; F. Thomas; W. Fitzgerald (Captain); H. Spachkam (Secretary); J. Kirk; S. Dennison (President); H. Measday; W.A. Thompson; A. Bannerman; F. Field; H. Maddern. Middle row: D. Kirk; V.Willis; H. Weetro; R. Kirk; T. Linder; W. Millard; D. Bevan; C. Thomas; C.A. Thomas. Front row: H. Thomas; G. Langsford; J. Willis; F. Millard; G. East; B. Bailey (Umpire); B. Willis; L. Meller; A. Roberts; B. Kirk; T. Willis. 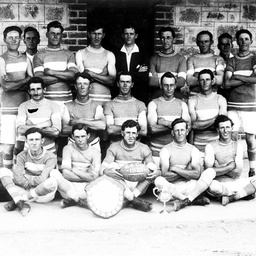 Football team, KimbaThe wild and wooly Football team premiers of the great Norwest, includes four members of the Tullock Survey team Cadets Kelly, Tresdtral, Dinan & Uphill. A football team possibly from Quorn.GENERAL: A football team, possibly from Quorn. 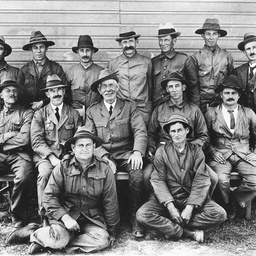 Second row: fourth from left W.R. Thompson; second from the right M. Williams. 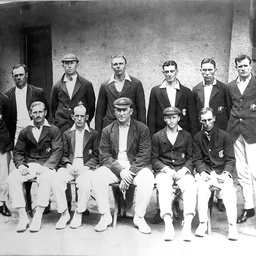 Third row: second from left Alf Thompson; fifth from left Tom Bury; first on the right Dave Hammond. 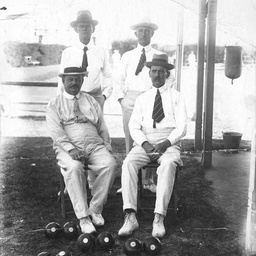 Four South Australian bowls players.Four South Australian bowls players photographed at a bowling green where they are involved in the Colonel Light tournament; names not known. 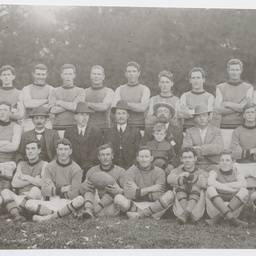 Goodwood Park football clubGOODWOOD PARK: Group photograph of members of the Goodwood Park football club, 1912; back row: W. Muggleton; H. Smith; G. Davis; F. Banfield; C. Angas; H. Wallace; J. Keam; centre row: S. Kirkbright; E. Hough (captain); H. Colwill (chairman); :B. Hendy (vice captain); W.J. Spencer (secretary); W. Frankcom; front row: F. Frankcom; R. Ritchie; J. Lonie. 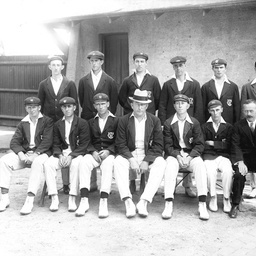 A group of cricket players in AdelaideA group of cricket players in Adelaide, the English team that toured Australia in 1920-1921 captained by J.W.H.T. Douglas, seated fourth from left middle row. 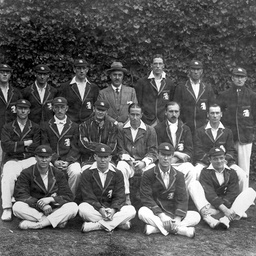 Group of cricketers representing AustraliaAustralian cricket team with Warwick Armstrong, captain, seated centre of the front row. The Australians are: (back row)JM Taylor, W Bardsley, J Ryder, JM Gregory, EA McDonald, AA Mailey, CE Kelleway. (front row) CE Pellew, HL Collins, WW Armstrong, WAS Oldfield, RL Park (12th man). Third Test v England at Adelaide January 14-20 1921. 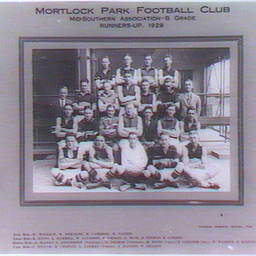 Group of members of Mortlock Park Football teamGroup of members of Mortlock Park Football team. Back row (left to right): W.Wallace, W.Beeching, R.Cameron, W.Nation. Third row: E.Binns, A.Hammill, W.Davidson, S.Nieman, G.Muir, E.Thomas, B.Gordon. Second row: A.McLean, L.Henderson (vice-captain), G.Thomas (chairman), M.Binns (captain), T.Goldner (secretary), W.Warren, E.Martin. Front row: J.Hooper, R.Chaplin, A.Jarman (umpire), J.Hanlon, W.Headon. 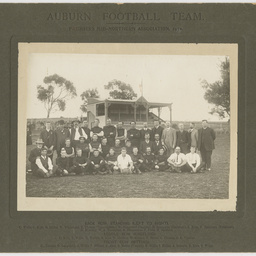 A group of men in football attire posed in front of a corrugated iron building.A group of men in football attire posed in front of a corrugated iron building, possibly in Benalla. The players wear dark jumpers with a single broad, light horizontal hoop. William John Howship (1874-1932) opened a photography studio business in Nunn Street Benalla in April 1904. He expanded the business by selling small format Kodak cameras and providing a 24 hour film processing service as well as the actual photography work, both studio and outdoor. The collection consists of 1250 dry plate glass negative images created by Howship between 1904 and 1931. Images include views of Benalla and surrounding districts, local events such as floods, concerts and military ceremonies and a large body of portrait work. ILLAWARRA RUGBY FOOTBALL CLUBPersons in photograph: Left to right - top row Arthur Yates, P. Larkin (Manager), J. Mclosky, S. Thorne (Chairman), C. Condon, J. Ainsworth (Secretary). Centre - W. Kirby (Management Board), P. Dwyer (Captain), G. Dean, W. Thomas, J. Sharpe, J. Dingle, B. Hickman, S. Baker. Bottom - M. Hegarty, F. Sloan, F. Taylor, G. Barnes, H. OBrien. Kadina and Wallaroo Mines Cricket ClubKadina and Wallaroo Mines Cricket Club. Premiers Y.P.C.A. season 1910-1911. B. Hand (Umpire), E. Head (Scorer), Alf Dodd (Umpire), P. Raymond, G.P.Perkins, T.H.Raymond, W. White, A. Dodd, F.S. Brown, G. Dodd (Captain), T. Tamblyn (President), J. Rilston (Vice-Captain), E. Edwards, R. Raymond, H. Langdon. Kia Ora football team 1922Group portrait of the Kia Ora football team 1922 with shield, inscribed football and cup.